As students and teachers head back to school every fall, buildOn’s Service Learning Program swings into action. In September, thousands of buildOn students from underserved communities in the U.S. serve warm meals at homeless shelters, tutor young students at elementary schools, and spend quality time with senior citizens. And in October, our Service Learning Program really hits its stride as even more students dedicate themselves to lifting up their communities from within. The incredible service of our students is just one example of what the phrase ‘back to school’ means at buildOn. It also brings to mind buildOn’s global school construction program as children and adults, previously denied their right to education, step into classrooms for the first time in seven of the economically poorest countries in the world. And we’d be remiss not to mention that this time of year also signifies that in the U.S., buildOn Alums are moving into the dorms and heading to classes at universities and colleges, often as the first in their family to pursue higher education. Read on to learn more about what back to school means at buildOn through the inspiring stories of our students in the U.S. and abroad. For Vivian Feng, the first day of her junior year felt far away, even just two days before the start of the school year. And that’s because it was. After all, Vivian goes to Oakland High School and she was in Malawi. Above: Vivian (right) recently spent a Saturday beautifying the Carmen Flores Recreation Center with other buildOn students in Oakland. As a junior at Oakland High School, Vivian has already surpassed 300 hours of service with buildOn. But upon returning home and heading back to school, Vivian and her fellow buildOn students in Oakland wasted no time doing what they’re best known for—dedicating themselves to serving their own communities. September marks a new school year of service at buildOn, with thousands of high school students from underserved high schools and communities mobilizing to give back through buildOn’s Service Learning Program in Boston, the Bronx, Bridgeport, Chicago, Detroit, and Oakland. 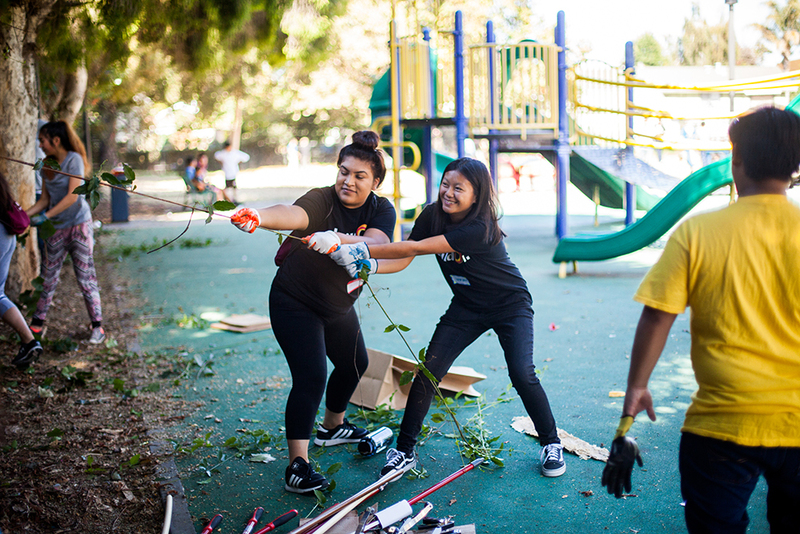 Vivian and her fellow buildOn students in Oakland wasted no time doing what they’re best known for—dedicating themselves to serving their own communities. And since the start of the 2018-19 school year, buildOn students have already made a lasting impact. 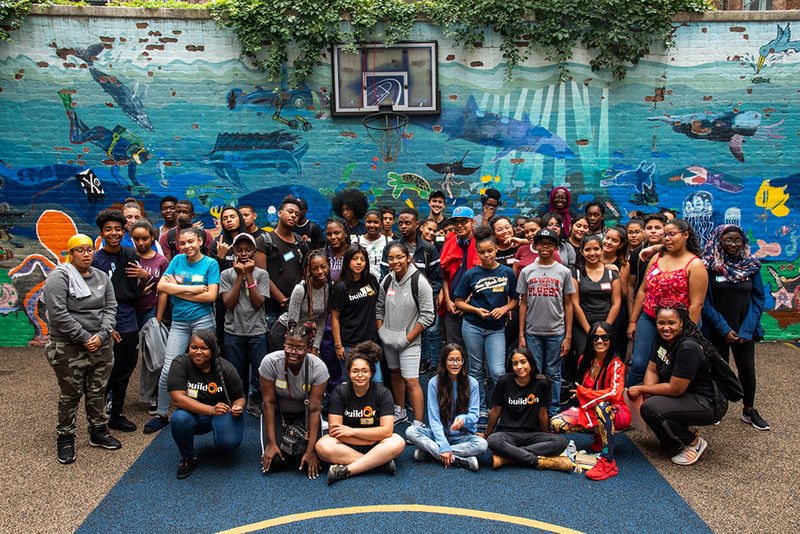 More than 200 buildOn students in the Bronx led middle schoolers from a nearby school in beautifying their school’s courtyard with an inspirational mural. In Chicago, 209 students came out on a Saturday to perform random acts of kindness downtown. And in Oakland, Vivian and her classmates have started spending their Saturdays and weekdays after school fighting food insecurity and mentoring young children. Above: buildOn students from the Bronx and students from a local middle school stand in front of the mural they worked on together. Every school that buildOn constructs abroad means increased access to education and literacy for an entire community. The new school in Kamtapo village that Vivian helped break ground on is one of 56 schools that buildOn will build in 2018 in Malawi. Every school that buildOn constructs abroad means increased access to education and literacy for an entire community. This access is only furthered by buildOn’s Enroll program, which identifies school-aged children who are not currently attending school and works with their families to make sure they are able to enroll and start learning. buildOn’s commitment to building schools in communities that have never had adequate school structures, combined with the Enroll program, ensures that more and more students like Yiwonda Phiri, a young girl from Molosa, Malawi, are stepping into the classroom and learning. For most of her childhood, the closest school for Yiwonda was six kilometers away—a distance too far for her to walk to and from school every day. But when buildOn partnered with the nearby community of Kamtsiro and built a new school block, Yiwonda was finally able to start her education at the age of eight. 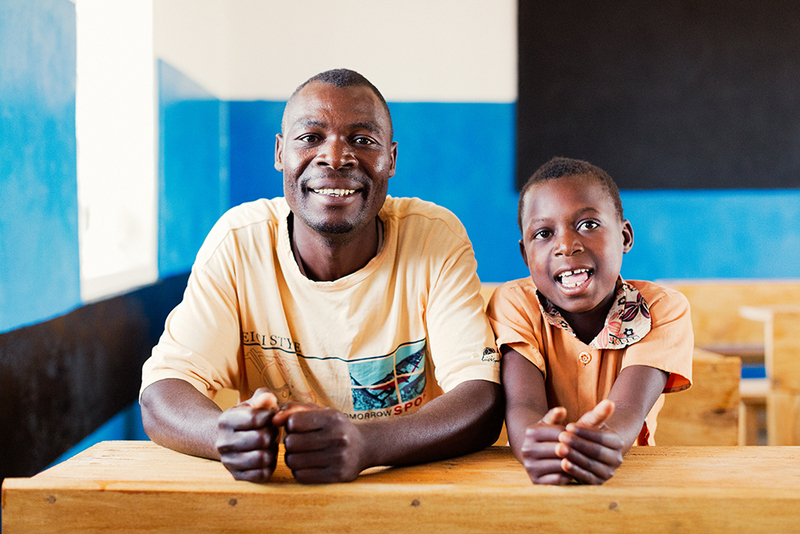 Above: Yiwonda and her uncle pose for a photograph inside the buildOn school in Kamtsiro on Yiwonda’s first day of school. Yiwonda’s story is all too common in Malawi, where the literacy rate is only 66%. And because girls and women are more likely to be denied education in Malawi than boys and men, the female literacy rate is even lower—around 59%. Gender equality is a cornerstone of buildOn’s global school construction methodology, and buildOn ensures that girls and women are an integral part of the entire school building process from the construction site to the finished classrooms. Before breaking ground on a new school, local community members sign the buildOn Covenant—a document outlining their commitment to send girls to the new school in equal numbers as boys. 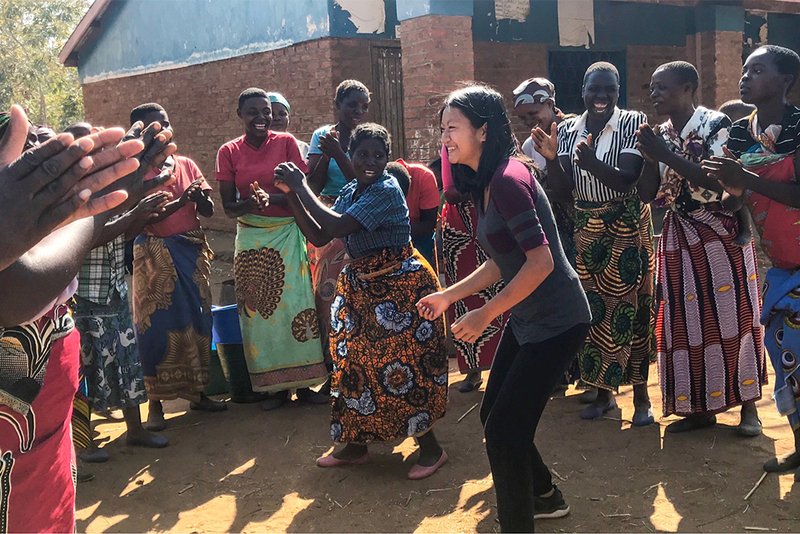 Above: Vivian joins a community member in the center of a dance circle while on Trek in Kamtapo, Malawi. That kind of impact—helping make a positive difference on someone’s life—is something that Darryl Ervin, a buildOn Alum from Detroit, knows all about. At buildOn, 97% of our students graduate high school and 88% go on to college. Darryl, who is now a freshman at Michigan State University on a full-ride scholarship, credits his experience on Trek with putting him on the path to college. Now, he’s looking to make sure that college is a possibility for all kids in Detroit. At buildOn, 97% of our students graduate high school and 88% go on to college. 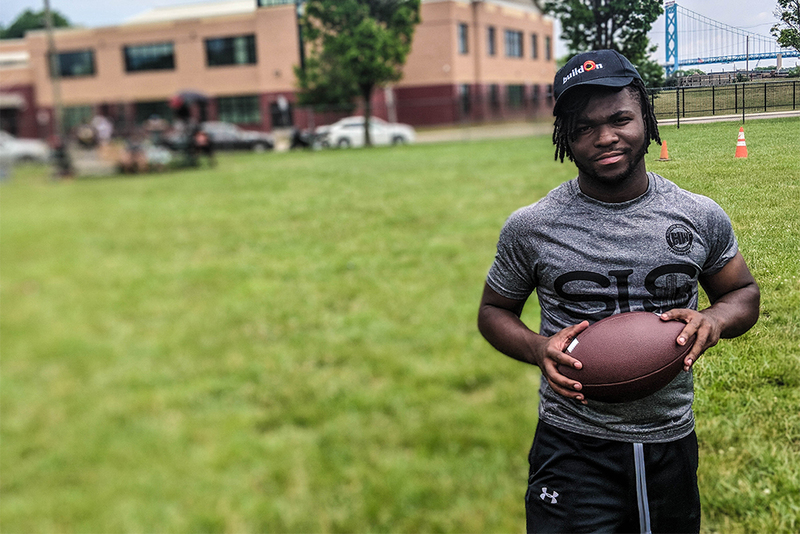 After graduating from Western International High School with more than 230 buildOn service hours, Darryl and fellow buildOn student Marcus Toure spent their summer giving back to kids in Detroit through an organization they founded together, SLS Detroit. Darryl and Marcus tutored elementary school students, organized a youth football camp focused on cultivating leadership skills, and hosted a backpack giveaway for children in their community. A month into his studies at Michigan State, Darryl is deciding on majoring in either Marketing or Management. After college, Darryl wants to start his own business and use the proceeds to give back. “One of my goals is to build a big rec center, where people from the community can come to play sports and there are classrooms for tutoring,” Darryl says. Like Vivian, and like buildOn students across the U.S., he’s determined to keep serving and making the world a better place.